Provide comfort for the family of Alice Fogg with a meaningful gesture of sympathy. 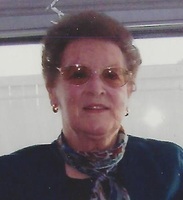 We are sad to announce the passing of our mother Alice Louise Fogg on March 15th, 2019. Wife of the late Bud Fogg. Dearest companion of Arthur Asher for many years. Mother of Bob, Dianne, Marg and the late Allan. Mother-in-law of Larry, Barb, Karen and the late Wayne. Grandmother of Jeff, Rick, Collen, Tyler and Hailey. Great-grandmother of Ainsley, Brenton, Journey, Ivy and Jackson. Great-great-grandmother of Scarlet, Stanley, Sydney and Luna. Mom you will be in our hearts forever. To send flowers in memory of Alice Louise Fogg, please visit our Heartfelt Sympathies Store.